Summary: Solitary aneurysms of spinal arteries lacking associated vascular malformations are rare. We report three patients with spinal subarachnoid hemorrhage (SAH) due to rupture of such aneurysms, which regressed spontaneously, as confirmed on conventional angiography. One patient had spinal SAH with presumed spontaneous dissection of a segmental artery. In the other two, SAH resulted from ruptured fusiform aneurysms of the artery of Adamkiewicz immediately proximal to the anterior spinal artery. Solitary aneurysms of the spinal arteries appear to be etiopathologic entities completely different from intracranial aneurysms. Spontaneous occlusion seems to be common, justifying a wait-and-see strategy rather than urgent treatment. Subarachnoid hemorrhage (SAH) of spinal origin is a rare event and accounts for less than 1% of all cases reported in the literature (1). The most common etiology of spinal SAH is bleeding from a spinal cord arteriovenous malformation (SCAVM), followed by hemorrhage from intraspinal neoplasms (predominantly neurinomas and ependymomas). Aneurysms of the spinal arteries are extremely rare. In more than 3000 spinal angiograms reviewed by Djindjian et al (1), only one isolated aneurysm was found. Garcia et al (2) reported one case of a ruptured aneurysm of the artery of Adamkiewicz. This aneurysm was discovered during postmortem examination in a pregnant 34-year-old woman. Histopathologically, inflammatory and infectious features were observed in this case. Intraspinal aneurysms are rarely found in association with SCAVM, Klippel-Trenaunay-Weber syndrome, coarctation of the aortic artery, or (even more infrequently) aortic arch interruption (3). We report three patients with spinal SAH resulting from rupture of a solitary intraspinal aneurysm. A 62-year-old female patient suddenly developed severe headache, followed by nausea and vomiting. The next morning, she reported intense nuchal back pain radiating to the lower back and across her rib cage. On the way to her general practitioner, she developed progressive paraparesis, primarily and most severely involving the right leg, with a sensory level below T8. Initial MR imaging of the cranium and spine did not reveal any definite signs of acute intracranial or spinal hemorrhage. The patient was then referred to our institution for further diagnostic measures. On admission, she was in good general condition without any mental disturbances. In contrast to the notable neurologic deficits observed during the initial examination, her current sensorimotor function was not impaired. All muscle tendon reflexes were elicited symmetrically, and no pathologic reflex patterns were found. Neither the Lhermitte sign nor positive meningeal stretch signs were observed. Coordination and fine motor skills were preserved bilaterally. Repeat MR imaging examination (Fig 1) and subsequent cerebral and spinal angiography (Fig 2) delineated a subarachnoid spinal blood clot extending from T2 to T6, as well as an intraspinal paramedullary aneurysm at T5, originating from the radicular branch of the right segmental artery T6 (Fig 2). Case 1. 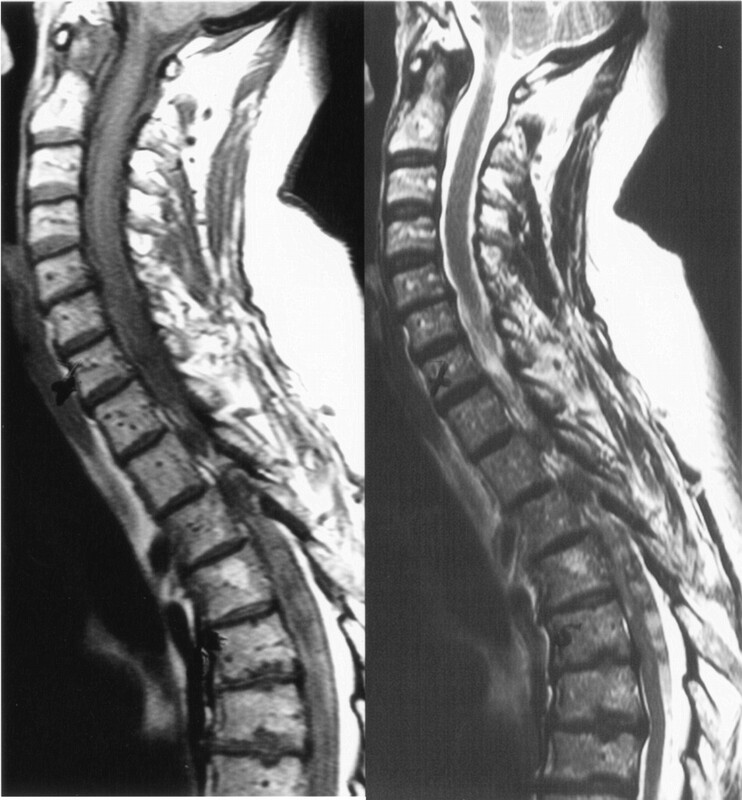 Sagittal T1- (left) and T2-weighted (right) MR images show SAH extending from T2 to T6. Case 1. 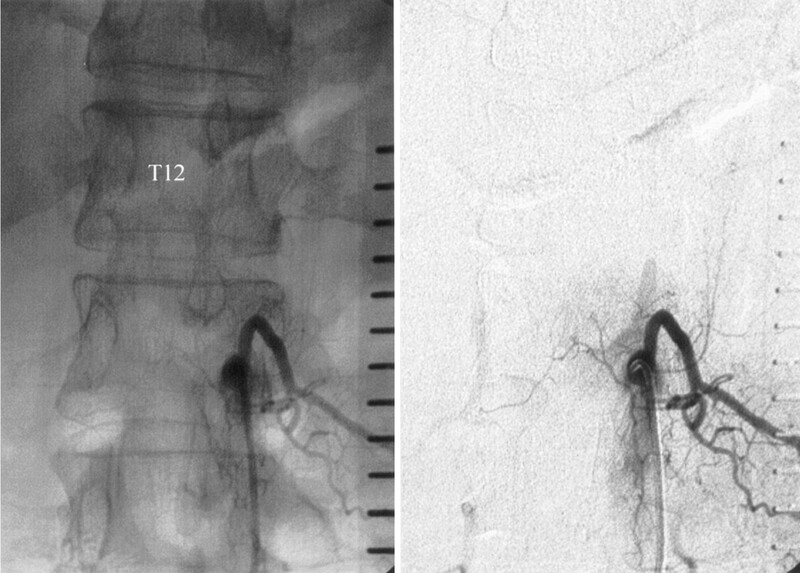 Left, Posteroanterior angiogram shows a small fusiform aneurysm of the radiculopial artery at the level of T5 collateralized by segment artery T6. Image does not show the segment of the artery at T5. Right, Posteroanterior control angiogram does not show the aneurysm but does depict the opacified segment of the arteries at T5 and T6. In view of the clinical and radiologic findings, a decision was made to surgically remove the blood clot and attempt clip ligation of the aneurysm. 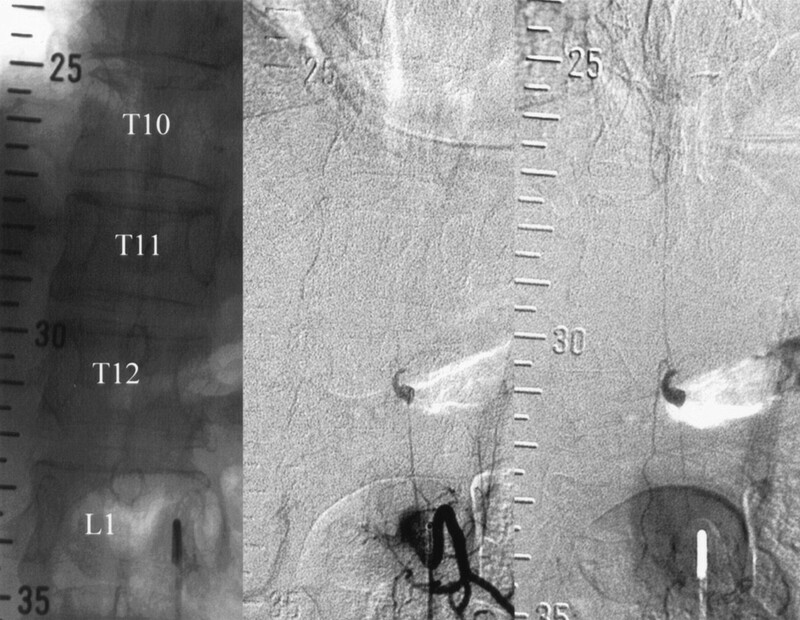 The approach was a right-sided hemilaminectomy at T5 and T6 with consecutive intradural exposure of the right hemicord and inspection of the corresponding intraspinal vessels. However, atrial fibrillation delayed surgery until the 26th day after the onset of initial symptoms. During operative exploration, the aneurysm was not detected despite thorough inspection of all intraspinal vessels, including the radiculomedullary arteries, which were followed via the nerve root sleeves to the spinal foramina. The procedure was eventually terminated after inspection and removal of the intradural blood clot. When the patient awoke from general anesthesia, she did not present with any new focal neurologic deficit. On the 4th postoperative day, repeat spinal angiography was negative regarding the intraspinal aneurysm previously detected. 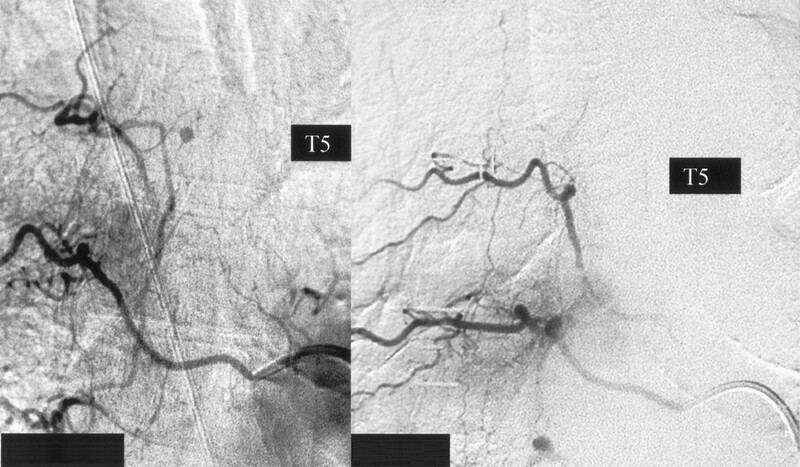 However, the right T5 segmental artery, which was occluded during initial angiography, was now clearly delineated (Fig 2). An additional follow-up MR-angiographic study of the spine did not reveal any intraspinal vascular malformation. The patient was referred to a neurologic rehabilitation unit on the 13th postoperative day, without any residual neurologic deficits. Her subsequent clinical follow-up was uneventful. A control angiogram was later obtained and did not show any spinal vascular malformation. A 48-year-old previously healthy man had acute abdominal beltlike pain in the upper lumbar region. This was followed by the development of paraplegia associated with bilateral anesthesia below T12. These symptoms and signs lasted for about 15 minutes, with subsequent complete recovery. They occurred in a similar fashion on the following day. Since the onset of the initial symptoms, the patient had persistent nuchal rigidity and neck pain. After the second acute episode of transient paraplegia, mild paraparesis remained for several days, with complete spontaneous resolution of all neurologic symptoms and signs. The initial working clinical diagnosis before diagnostic angiography was dissection of the lumbar aorta. However, this was excluded during emergency abdominal and pelvic contrast-enhanced CT. Subsequently, the patient’s body temperature increased to 38°C with concurrent elevation of inflammatory laboratory parameters. Two sequential lumbar punctures revealed xanthochromia and hemorrhagic CSF with pleocytosis. Spinal MR imaging and MR angiography revealed SAH (Fig 3) and a contrast-enhancing intradural lesion at T12. Spinal angiography confirmed the suspected diagnosis of intraspinal aneurysm (diameter, 5 × 7 mm) of the artery of Adamkiewicz, originating on the left side at the level of L1 (Fig 4). Case 2. Thoracolumbal MR images and contrast-enhanced MR angiogram (CE-MRA) shows a severe SAH and aneurysm at the level of T12 (arrow). Case 2. Posteroanterior angiograms show a partially thrombosed fusiform aneurysm of the radiculomedullary branch of the artery of Adamkiewicz originating from the left side of L1. The aneurysm occurs immediately before the radiculomedullary artery reaches the longitudinal anterior axis supplying the anterior spinal artery. 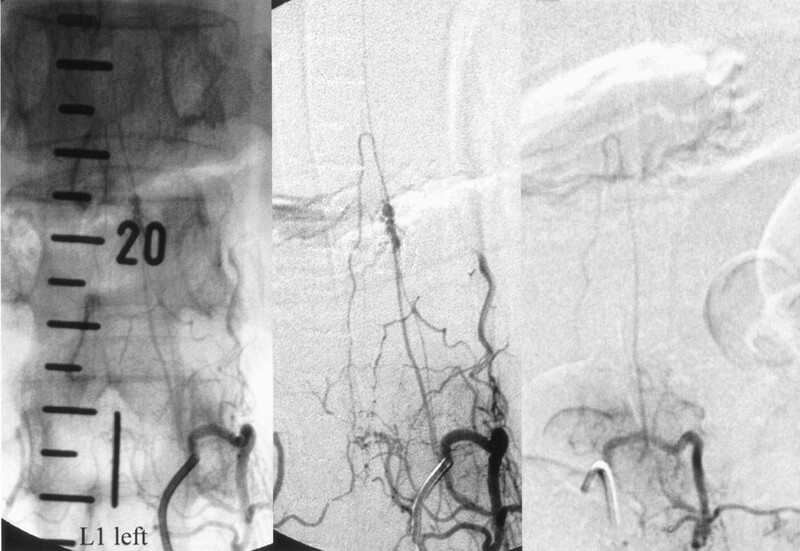 This aneurysm, with spatial extension of about 5 × 7 mm, was nearly identically depicted on MR angiography (Fig 3). Initial blood screening for systemic mycosis revealed extremely elevated Candida antigen levels, as well as negative Candida antibodies. Antimycotic therapy was initiated with fluoconazol 400 mg twice daily for 3 days followed by 200 mg twice daily for 3 months. After treatment with fluoconazol, Candida antigen levels decreased to the upper normal range. Immunologic screening showed negative results for HIV. However, two consecutive blood tests yielded decreased values for CD8 lymphocytes. Functional tests of CD8 cells revealed normal proliferation, including stimulation with Candida antigen. Six months after the initial episodes of transient paraplegia, the patient again developed paresthesias of both legs lasting for several days. Subsequent clinical remission occurred, leaving an area of residual paresthesia on the plantar surface of the right foot. 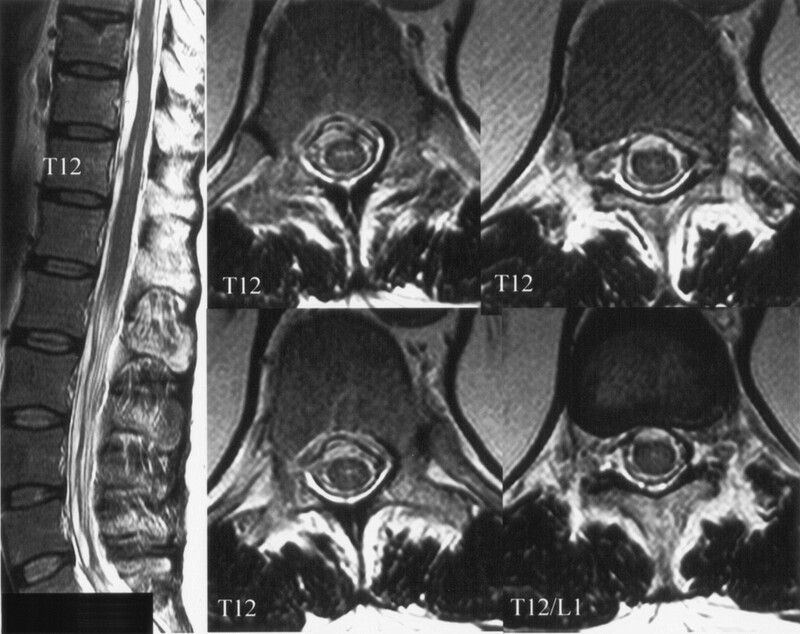 MR images (Fig 5) revealed a new, small hyperintensity in the center of the spinal cord at T12, measuring about 2 cm in length. This signal intensity had not been detected during previous follow-up MR imaging examinations. Control angiography demonstrated complete occlusion of the aneurysm as well as the anterior spinal artery (Fig 6). Case 2. Control MR images obtained 6 months after initial episodes of transient paraplegia show posthemorrhagic adhesions and a central spinal cord infarct at level T12 but not the patient’s aneurysm. Case 2. Control angiograms of the segment artery at left L1. Images show complete occlusion of the aneurysm, as well as the artery of Adamkiewicz and the anterior spinal artery. A 69-year-old woman developed acute back pain, vomiting, and walking impairment. The initial working diagnosis was aneurysmal SAH, but cranial CT revealed no pathologic findings. However, xanthochromia and hemorrhagic CSF with pleocytosis was found during two subsequent lumbar punctures. Shortly after her admission to our institution, she developed paraplegia associated with urinary retention. MR images of the spine revealed SAH with blood clots in the thoracolumbar region. Spinal angiography displayed an irregular intraspinal aneurysm of the radiculomedullary branch of the artery of Adamkiewicz; this was located on the left side with its origin at the level of L1 (Fig 7). This aneurysm measured about 2.5 × 8 mm. Owing to the striking similarities between this case and the findings in patient 2, a mycotic etiology was primarily suspected. However, results of a complete laboratory workup for systemic mycosis including examination of blood, urine, and stool samples, were negative. Therefore, the working diagnosis was changed to a spontaneous dissecting aneurysm. Case 3. Posteroanterior angiogram (left and middle) and 3-month control angiogram (right) in a patient with a fusiform aneurysm in the artery of Adamkiewicz originating from the left side of L1. Like case 2, the aneurysm occurs immediately before the radiculomedullary artery reaches the longitudinal anterior axis supplying the anterior spinal artery. Control image shows spontaneous aneurysm occlusion without therapy. Three weeks later, the patient was discharged home with complete spontaneous resolution of all neurologic symptoms. Control angiography performed about 3 months later at the Department of Neuroradiology of the University of Hannover, Germany, demonstrated spontaneous complete occlusion of the aneurysm. In contrast to the findings in patient 2, the anterior spinal artery was preserved (Fig 7). The patient’s subsequent clinical follow-up was uneventful. Solitary aneurysms of spinal arteries lacking associated vascular malformations are extremely rare, and current knowledge on the incidence and natural history of spinal aneurysms are to a limited number of case reports (5). Rengachary et al (5) reviewed 57 cases of spinal artery aneurysms. These aneurysms were either classified according to associated vascular lesions, such as SCAVMs (n = 25), coarctation of the aorta (n = 4), syphilis and arteritis (n = 3), fibromuscular dysplasia (n = 1), pseudoxanathoma elasticum (n = 1), or presumed idiopathic lesions (n = 23). Most of the reported aneurysms were small, with diameters less than 3 mm. Their shape was fusiforme, lacking a defined neck. Regarding the current body of evidence, no clear predilection site appears to exist for spinal aneurysms at any specific segment of the spinal artery. In contrast to intracranial aneurysms, the location of spinal artery aneurysms is often unrelated to arterial branching sites. The pathogenesis of spinal artery aneurysms associated with SCAVMs and coarctation appears to be related to hemodynamic factors. Therefore, these lesions may be classified as flow-related aneurysms. In contrast, inherited connective tissue disorders and acquired vascular lesions (due to infections or inflammatory vasculopathies) compromise the strength of the arterial wall, ultimately leading to aneurysm formation in the absence of a primary pathologic alteration of local hemodynamics. Yoong et al (6) reported a patient with mucosa-associated lymphoid tissue lymphomas of the parotid glands and granulomatous angiitis who presented with spinal subdural hemorrhage secondary to rupture of one of multiple inflammatory aneurysms arising from the radiculomedullary arteries. Because this patient survived only a few days after admission, the multiple spinal aneurysms were primarily diagnosed during necropsy. Therefore, whether early diagnosis of granulomatous angiitis and timely institution of immunosuppressive treatment would have had beneficial effects in this patient is a matter of speculation. Because many of the reported spinal aneurysms have a fusiforme rather than saccular shape, standard surgical treatment (clip placement) is not possible. This leaves either trapping of the aneurysm (with occlusion of the parent vessel) (5) or wrapping (7) as surgical options. Generally, surgical treatment of any spinal aneurysm should be performed only if the various types of inflammatory and noninflammatory vasculopathies are excluded as the underlying etiology. In our case 2, a partially thrombosed fusiform aneurysm of the radicular segment of the artery of Adamkiewicz was found immediately proximal to the anterior spinal artery. The exceptionally increased levels of Candida antigen in systemic blood samples, as well as the spontaneous occlusion of the aneurysm observed during antimycotic therapy, make the differential diagnosis of a mycotic aneurysm most likely. Before angiographic confirmation of spontaneous occlusion was available, our strategy for endovascular treatment was advancing a microcatheter to the right L1 radicular artery and inducing flow arrest proximal to the aneurysm. We planned the placement of a second catheter inside the L2 segmental artery (giving rise to a large posterior spinal artery supplying the conus arcade and potentially providing an anastomosis to the anterior spinal artery). Further, we intended to perform the endovascular intervention with local anesthesia and electrophysiologic surveillance to allow for repeated clinical testing and evoked potential monitoring. If clinical and electrophysiologic tolerance to test occlusion was sufficient, obliteration of the aneurysm with fibrin glue was intended as the definitive treatment measure. However, the diagnosis of mycotic aneurysm prompted the immediate institution of antimycotic therapy as primary noninterventional treatment option. Interestingly, immunologic screening revealed reduced CD8 T-cell function, which has been associated with severe immunodeficiency in children (4); this might have been the underlying cause of the systemic Candida infection. In contrast to admission MR imaging, follow-up MR examinations revealed reduced aneurysm size and posthemorrhagic arachnoiditis with intrathecal adhesions. Contrast-enhanced MR angiography failed to show the aneurysm. Patient 2 initially refused early control angiography. Further follow-up MR examinations revealed spontaneous regression of the arachnoiditis as well as the size of the aneurysm. About 6 months after the onset of initial clinical symptoms, the patient again developed a transient neurologic deficit. 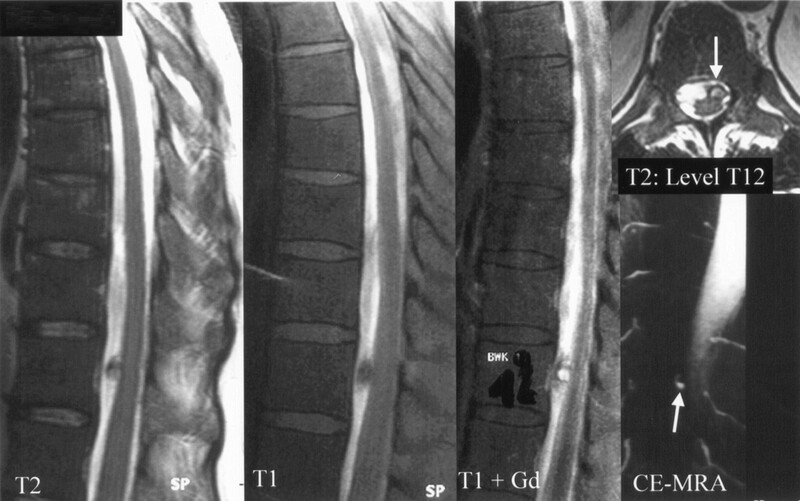 At this time, MR imaging of the spine revealed infarction of the spinal cord (central medullary hyperintensity at the level of T12 on T2-weighted images). Additional angiographic studies demonstrated complete occlusion of the aneurysm, including the parent vessels (artery of Adamkiewicz and the anterior spinal artery). The anterior spinal artery could not be visualized with an injection of contrast agent into adjacent segmental arteries, but the formerly prominent right posterior spinal artery L2 appeared slightly enlarged, suggesting an anastomosis between the posterior spinal artery, the conus arcade, and the anterior spinal artery. If this were the case, the medullary infarct at the T12 spinal level might have been interpreted as a watershed-zone infarct. Patient 3 had spinal SAH from a spurious aneurysm of the radiculomedullary branch of the artery of Adamkiewicz. After different types of vasculitis and noninflammatory vasculopathies were excluded, the patient was referred to a neurologic rehabilitation center. Taking the natural history of the most recent case (patient 2) into account, we primarily thought that the aneurysm was mycotic and classified it as spontaneous dissected aneurysm, as all of the blood examinations showed no specific evidence of inflammation. As a consequence, no antibiotic therapy was instituted. We adopted a wait-and-see strategy with follow-up angiography planned after 3 months, when images demonstrated complete spontaneous occlusion of the aneurysm. Patient 1 presented after rupture of a small fusiform aneurysm supplied by the right radiculopial artery T5. The exact etiology of this aneurysm remains speculative. It may be hypothesized that dissection, as a primary event, resulted in the formation of a spurious aneurysm with subsequent hemorrhage. In turn, this hemorrhage might have caused occlusion of the parent vessel (right segmental artery at T5). However, the aneurysm was collateralized from the right of the T6 segmental vessel, as demonstrated during initial diagnostic angiography performed shortly after the hemorrhage occurred. Surgery was performed at the 26th day after the onset of clinical symptoms. Despite a thorough search, the aneurysm could not be detected during surgery. Angiography repeated on the 4th postoperative day as well as 5 months later showed complete disappearance of the former aneurysm, while the formerly occluded right segmental artery T5 was now clearly delineated. Retrospectively, this aneurysm could have been primarily classified as pseudoaneurysm, according to Berenstein and Lasjaunas (8). Although it cannot be excluded that surgical intervention played a role in the later disappearance of the aneurysm, spontaneous healing of the dissection with recanalization of the parent artery and complete obliteration of the aneurysm appears to be the favorable hypothesis. Solitary aneurysms of the spinal arteries, which are extremely rare, appear to be etiopathologic entities completely different from intracranial aneurysms. Most of these aneurysms are fusiform and small. The differential diagnosis should be directed toward the exclusion of different types of vasculitis and noninflammatory vasculopathies before the initiation of surgical or endovascular treatment. If surgical intervention is delayed for any reason or if emergency surgery is not needed, repeat angiography should be seriously considered before any delayed surgical intervention is done because spontaneous regression is likely. In view of our still-limited experience with three cases of spinal artery aneurysm rupture and subsequent spontaneous occlusion, a wait-and-see strategy appears justified and may be more adequate than emergency surgical or endovascular intervention. The authors thank Emmanuel Houdart, MD, Hospital Lariboisière, Paris, France, for his thoughtful contributions, especially concerning case 2. Accepted after revision May 13, 2004. Ruptured aneurysm of the artery of Adamkiewicz: is conservative management the standard of treatment in the current era? Subarachnoid hemorrhage due to isolated spinal arteries: Rare cases with controversy about the treatment strategy.